I sat down with BlogHer.com in preparation for my keynote at BlogHer Health LA. #BlogHer Health speaker, Millana Snow, talks us through her tried and true wellness practices, the health trends she predicts for 2019 and the wellness fads we should leave behind. As we all know, the holidays can be a prime time to neglect the health and wellness practices that we set at the beginning of the year, but just because holiday parties and stressful shopping can come in the way, it is still important to try to continue your personal rituals and health-focused practices year-round. 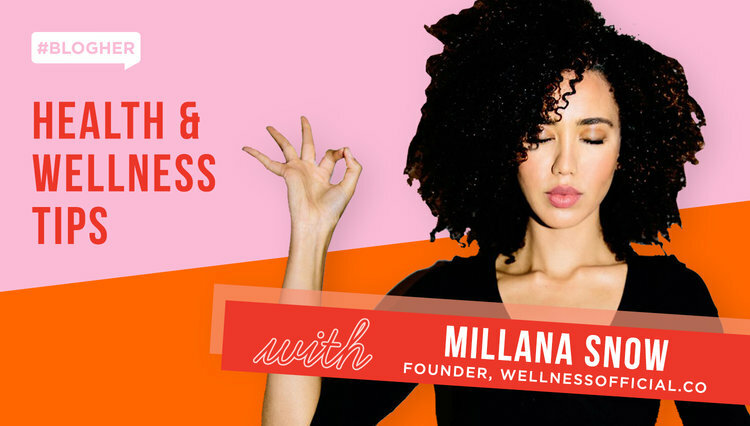 We chatted with #BlogHer Health 2019 speaker Millana Snow to see how she, as a reiki healer, meditation teacher and model, maintains her health during the busy months. BH: Your interest in wellness began at a very young age and your journey to where you are today has been very unique. Can you tell us about it? MS: I have always been a seeker and a very spiritually curious person. When I was in elementary school, I would read my tarot cards and try to hypnotize my friends, and I meditated. In middle school, I studied Hinduism, Wicca and reincarnation by reading dozens of books on my own volition - I even became a born-again Christian after that. After many years of self studying, I realized that what I was seeking was inside of me; the deeper spiritual connection of all these paths were accessible through my own inner practice. Today as a healer, I have merged many religions, healing modalities and traditions as I continue to learn and seek. BH: You must be so busy between handling your work as a reiki healer, meditation teacher, model and now founder of your own business Wellness Official. How do you still find time to incorporate self-care into your life and what are your daily rituals? MS: I don’t make it an option; self care and daily spiritual practices is my life. I have practiced this way of life for years to get to this point and intend to deepen and expand my daily practice of self care and spiritual connection. For me, prayer, meditation, and mindful practice can come in many forms. Sometimes I must be more diligent about where I need more support, but everyday I meditate and everyday I pray and observe with gratitude. Some days I could use more of all of the above, and this is why I call it a practice. Right now, I’m doing a 40-day, 7-minute Kundalini practice called Har Meditation for Prosperity which I do with my online group at Patreon.com/MillanaSnow and through our private Facebook group. But I also mix in green juices, good restful sleep as a priority, transparent and loving relationships, walks with my dog, baths and lots of prayer. These things can take just a few minutes and I make them a priority because my work is more inspired and powerful when I do. BH: The holidays can be very stressful between travel, events, hosting and more. What are your 3 tips for maintaining wellness practices and mindfulness during the chaotic holiday months? MS: First, take herbal remedies to keep colds away, I really like anything from Wish Garden or Doterra. Second, bring snacks and non-perishable foods with you so you can eat the food that’s best for you wherever you go. Third, go to a yoga class or practitioner session when you’re in the thick of things, especially when traveling. You will be able to find practitioners and places on WellnessOfficial.co next year, but in the meantime, send me a direct message and I can help with great people and places all over the world! BH: What is the biggest wellness trend you predict we’ll be seeing in 2019? MS: I think we will see a lot more about the effects of Blue Light and phone screen time — information and studies that I think will lead to more products. I also think herbal tonics and medicine will become more mainstream (maybe even in CVS and Target!?). One of my faves that I have seen more lately is Elderberry, which I think will become more popular. BH: What wellness trend should we leave behind in 2018? MS: I think things will slow down with imported adaptogens. While I think they can be very supportive for our overall health, I think things will start to shift to more locally-sourced food and plants as healing medicine. I also feel that adaptogens should be taken under the advisement of a holistic health professional and I believe this will become a more common practice in 2019. Millana will be bringing her wellness talents to #BlogHer Health this January to lead a mindful moment on Friday 1/25. Don’t miss out on your chance to see her take the stage next month and set up your new year for health and success.